America’s streets are looking more and more like a war zone. Last week, in a small county in upstate New York with a population of roughly 120,000 people, county legislators approved the receipt of a 20-ton Mine Resistant Ambush Protected (MRAP) vehicle, donated by the US Defense Department to the county sheriff. Between the Armored Personnel Carriers locking down main streets in major American cities – mimicking our MRAPs in Afghanistan – or Special Weapons and Tactics (Swat) and Special Forces units canvassing our country, if we’re not careful, this militarization of our domestic policing will make-over America, and fast. Here’s how it all happened. A little-known Pentagon program has been quietly militarizing American police forces for years. A total of $4.2bn worth of equipment has been distributed by the Defense Department to municipal law enforcement agencies, with a record $546m in 2012 alone. In the fine print of the National Defense Authorization Act for fiscal year 1997, the “1033 program” was born. It allows the Defense Department to donate surplus military equipment to local police forces. Though the program’s existed since the 1990s, it has expanded greatly in recent years, due, in part, to post-9/11 fears and sequestration budget cuts. The expanse, however, seems unnecessary given that the Department of Homeland Security has already handed out $34bn in “terrorism grants” to local polices forces – without oversight mind you – to fund counter-terrorism efforts. Additional militarization, then, deserves congressional attention as the program is harmful and must be scaled back for a number of reasons. We make a serious mistake, I’m convinced, in equipping domestic law enforcement, particularly in smaller, rural communities, with this much military equipment. Tanks, grenade launchers, armored vehicles, and assault rifles are just a few of the items that have been transferred from military control to municipal police forces. Law enforcement agencies need only to arrange and pay for shipment in order to receive the items of their choice. One particularly egregious example is found in South Carolina, where Richland County’s sheriff acquired a tank with 360-degree rotating machine gun turrets. Sardonically, the vehicle has been named “the Peacemaker”. Swat teams, furthermore, are no longer found only in large, high-crime areas. Instead, even small rural towns now have the equipment to arm their own paramilitary units. 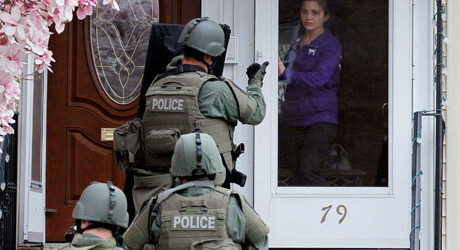 Investigative reporter Radley Balko estimates that around 150 Swat raids are performed every day in the United States. Second, the program encourages waste. Never mind, for a moment, that neither the Defense Department nor the Homeland Security Department has been audited – the only two unaudited government departments incidentally. Any waste from the 1033 program, then, has gone unnoticed thus far. Municipalities’ stockpiles have grown exponentially with billions of dollars’ worth of weaponry and equipment they simply do not need. This giveaway has created a shopping frenzy among law enforcement officials keen to scoop up equipment before someone else does. Take a look at these examples. A small town in Georgia without a body of water acquired boats and scuba gear. The same town ordered a shipment of bayonets, which is now collecting dust. In Texas, a town of only 835 residents received more than $3m worth of equipment, including deep-fat fryers, televisions, and playground equipment. The stories abound. Authorities often claim that the program assists local law enforcement without incurring costs for taxpayers. Yet the program requires that localities accept equipment “as is”, meaning that taxpayers foot the bill for all repairs, storage, or maintenance of the growing stockpile. Thus, the arms race ignited by these policies is as wasteful and costly as it is dangerous. Lastly, the program’s lack of oversight is irresponsible. Indeed, the amount of unaccounted for weapons, fraud, and abuse is alarming. Officially, state coordinators are required to ensure that local law enforcement agencies keep full inventories of the equipment they receive, and the localities must report any missing equipment and return any that is unused. But in practice, federal and state authorities infrequently check – if ever – to ensure that inventories are up to date. Effectively, then, it is the recipients of weapons who are left to regulate themselves. The results have been disastrous. For example, a sheriff in Illinois was accused of lending the assault rifles, which he got through the 1033 program, to his friends. Meanwhile, a firearms manager in North Carolina pled guilty to selling his on eBay. Worse, 11 districts in Indiana were completely suspended from the program because of the high volume of weapons they lost. And a county in Arizona acquired $7m worth of weapons and Humvees before giving them to unauthorized persons and attempting to sell them to boost their budget. The lack of oversight is appalling. State coordinators admit that they conduct very few in-person inspections. In New York, the state is apparently outsourcing the majority of their inventory work to a part-time, unpaid intern. And in Mississippi, it took six years before federal authorities discovered that a state office, which was ineligible for the program, had received $8m worth of equipment, despite the fact that the Defense Department is supposed to review the program every two years. The Pentagon program cannot continue in this manner. Congress should acknowledge the failure of this program and permanently ban military-grade weaponry, armored vehicles and aircraft from transfer to municipal police forces. If the Defense Department is to continue to lend surplus equipment to localities, it must vastly tighten oversight and ensure that no item go unaccounted for. On-site inspections must be frequent and consequences for noncompliance should be severe. If America is concerned about helping its police forces prevent violence, there are more cost effective ways of doing that. Since we know that cities and states with lower levels of violence have higher levels of education, healthcare coverage and economic opportunity, and lower levels of poverty and income inequality, that is where we should be investing taxpayer dollars. But when local police forces carry assault weapons and patrol America’s main streets with tanks and drones, the lines blur between the military and law enforcement. The growing militarization of the United States appears to be occurring at home as well as abroad, a phenomenon which is troublesome and sure to continue without decisive action. Scaling back the 1033 program is a much-needed start and would cast some light on the blurring line between military forces and the local police who are meant to protect and serve.